Finding the Windows Vista fully packaged product (retail) part numbers can be a bit of a struggle via the Internet or even our supplier's Web sites. Different key words for different folks. All full retail editions come with both the x86 (32bit) and x64 (64bit) DVDs. We sell retail into client locations as the foundation for our desktop OS virtualization setups. We then add on Windows Vista Software Assurance (>$75/Yr) and the Microsoft Desktop Optimization Pack for Software Assurance (>$20/Yr) for each required desktop VM on an Open Value Agreement with 3 year spread payment option. For virtualization where we require a fine tuned desktop via Group Policy, or Line of Business Application compatibility across a number of remote client users, we have a good thing going with this setup. Lately, we have seen a lot of news on the wire and in the blogosphere about vulnerabilities in our DNS setup. The news is such that Microsoft has reissued a Microsoft Security Advisory (956187). The threat is immanent, and we should be patching all of our client systems. Microsoft released Microsoft Security Bulletin MS08-037 on July 8, 2008, offering security updates to protect customers against Windows Domain Name System (DNS) spoofing attacks. Microsoft released this update in coordination with other DNS vendors who were also similarly impacted. Since the coordinated release of these updates, the threat to DNS systems has increased due to a greater public understanding of the attacks, as well as detailed exploit code being published on the Internet.Microsoft is not currently aware of active attacks utilizing this exploit code or of customer impact at this time. However, attacks are likely imminent due to the publicly posted proof of concept and Microsoft is actively monitoring this situation to keep customers informed and to provide customer guidance as necessary. When there is a need to setup document libraries for Office 2007 documents, the current SBS SharePoint V2 Companyweb site does not know what to do with them. To get that fixed, David Overton has an excellent post: How to get Companyweb (Windows SharePoint Services v2) to work with Office 2007. This command is via David's post, but must be emphasized as the Office 2007 documents will always open in Read Only mode without it. 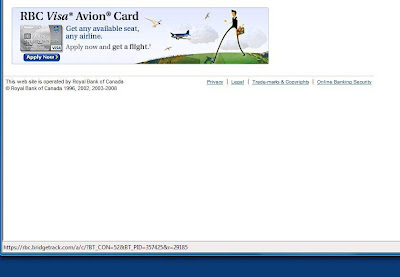 As per David's post which links to the following Knowledgebase article: KB 870853: Office 2003 and 2007 Office documents open read-only in Internet Explorer. David, thanks for sharing that. It has come in very handy! A while back we were brought in to help a fellow IT company owner by one of our local suppliers that we have been dealing with for years. The IT shop had an older SBS setup that had a choked SMTP queue. As we do with all drop-in situations, we outlined our hourly charges, resolution or not, and made sure that the business owner agreed to them ... which he did. We also have the local admin person create a user and password with domain admin privileges as a precautionary measure. That way they can delete that user when the job was finished. Well, it is now almost four months later, and they are refusing to pay us for our time. The SBS box was not setup properly. The wizards were not used and the Exchange box was an open relay. While we worked hard to get things right, the plugged queue just kept growing ... so the suggestion was made to swing to new hardware ... to which the business owner indicated they wanted things worked out instead. Eventually, the owner decided to take over themselves, wipe the box, and let us go. We set our invoice and indicated we would reduced our time billed (bad mistake - never devalue our own time), and he agreed. Where does the perception come from in our industry that if the task at hand could not be accomplished that our time is worth nothing? Take a car into a shop to be worked on and try to get it back without paying ... even if the shop did not find a resolution to the problem. That just will not happen. Then why is it an acceptable practice to not pay us for our time on the job no matter what the problem status at the end of the day? We are professionals, and just as mechanics we know that some situations cannot be resolved at the drop of a hat. Usually, that means that after a half an hour to an hour of scoping out the situation we are already providing feedback to the client or customer (they are different) that we may not be able to "fix" the problem. We begin to offer options to either work out the problem, with no guarantees, or we are saying it may be a lot more expedient to move on to other options. It is a sad day when we encounter a situation where a handshake is not honoured. It is even sadder one when the person we shook hands with is in our own industry. Not honouring one's commitments says a lot about the character of the business owner and their employees who may be shaking hands on their behalf. One of the key ways that we establish long term client relationships, in our case we have some spanning 10 years now, is by honouring our word. Our commitments are our gold. If we cannot honour our commitments with our clients and with others in our respective industry, we cannot expect to build our business up. We are in the relationship building business ... I.T. just happens to be the vehicle we are using to get there. When we have realized that, then we will be hiring people on who will be open to fostering those business relationships and to being formed into the type of I.T. Professional that can be counted on to follow through on their commitments. The customer may always be right, but the client knows their options and our professional opinion on the direction they should proceed in. That is the difference between them. Working together, we the I.T. support firm and our clients, along with the strong supplier and vendor relationships we have built, create and maintain a long term technology infrastructure and user skills vision. Along the way, we make sure to form our employees in that vision. UPDATE 2008-08-11: It seems that paying a personal visit to the I.T. company in question did the trick. A technician appeared from the back, acknowleged my request, and called the owner to indicate that I was there. A cheque soon followed. A new migration guide has been released for those who support clients that have grown close to the transition phase of the SBS lifecycle and are looking at EBS as the possible direction: Migrating from Windows Small Business Server 2003 to Windows Essential Business Server. The methodology looks to be similar to the process we would use to insert a new SBS server into an existing Windows domain. The document gives a good overview with the required steps to complete for the migration. Courtesy of the MS Download Center RSS Feed. Over all, we have been quite happy with the Trend Micro Client/Server/Messaging SMB product. It installs fairly smooth on the server and relatively smooth to the clients. In one case, we have upgraded our client's SBS server and the client machines to the new version of the product called Worry Free Business Security. This is the first SBS box that we have done this on with others to follow. Security Event ID 537: An error occurred during logon. Notice that there are a lot of them. The only indication that we are dealing with a Trend problem is from the Microsoft SBS newsgroup here: Failure Audit 537 in Event Log. Our circumstances are identical to the newsgroup poster. So, we too have opened a trouble ticket with Trend to further investigate the problem. For now, we will not be upgrading any further SBS boxes. The General Gets Our Vote - HHR SS Panel Arrives in 6-8 Weeks! I started working on them in my late teens, and grew attached to the smells, sounds, and speed of 350 horsepower small blocks, 400-500 big blocks, and later the multi-valve small displacement engines pulling all sorts of cars into all sorts of crazy speeds. For the last 6 years or more, I have owned a 1997 Ford Taurus V8 SHO. It has been a very reliable, very fast, and very maneuverable mode of transport. For both street and track I could ask for nothing better for my money. But, at 10 years, the reliability ratio to the age of the car is starting to equalize. No serious repairs done to date ... yet. So, do we want to spend any money on a 10 year old car versus putting that money into a new one? From a business perspective the answer is a resounding no! On the hunt for a replacement in the last year or so, there were many contenders to replace the SHO. But, none really stood out from the pack. Too many times in this city the power is required to escape others concentrating on other things. The power is important for highway travelling which we do a fair amount of for our business. Reasonable fuel consumption (when not into the throttle). SHO gets 340KM on 60 litres consistently for years in the city. Handling must be on par or vary close to the SHO's Semi Active Ride Control. Better product carrying capabilities than the trunk or back seat of the SHO. While doing an install at a client site, the phone system technician was in working on setting up the phone system integration into the SBS network with me. He had an Chevrolet HHR Panel as his company transport. What caught my eye was the lack of glass in the rear passenger doors. Right away, the element of security came to mind for any system or component contents that may be in the vehicle while parked. The other thing that struck me were the lines. On the Wikipedia entry for the HHR (Heritage High Roof), the styling cues pull from the 1940's era Chevy Suburban 2 door. Neat. This last weekend the dealer provided an HHR SS that was the standard 4 door layout for me to scoot about with on errands and to take Monique for a spin. What a lot of fun that drive was. The vehicle is stable at any speed, in corners, into twists and turns, and flat out a blast from "not to 60" in a shade over 6 seconds. GM's quality, fit, and finish have come a long way over the last couple of decades ... and that really shows through in the HHR I got to play with. So, we signed on the dotted line for one. We should see it in about 6 to 8 weeks. Any suggestions for logos and the like for the sides and back? The HHR SS Panel will be black with an ebony interior. When is it that time? We hear many different ways of describing our clients. Class A: Trusted Advisor Relationship. Class B: Consultant building towards Trusted Advisor. Let's talk about what needs to be done and then do it. New prospects, occasional clients, others. So, when we come across a situation where the prospective client, or even a relatively new client, does not seek to build a business relationship with us, what do we do? We take the time to fully evaluate our communications and prospective relationship building with that new client. Thank you very much for taking the time to approach MPECS Inc. with your current SBS and I.T. infrastructure needs. However, due to a number of new and ongoing I.T. infrastructure projects, our technicians are now booked well into the late Fall time frame. Thus, we will not be able to help you out at this time. Thank you again for approaching us. Maintaining a simple and polite brevity is of import here. An apology is not needed as we have done nothing to offend by politely declining their business. No matter what the financial status of our own company is, whether we are in Feast or Famine mode (not so applicable for us anymore due to our hybrid managed services setup), we must always keep in mind that our business' integrity comes before our need for cash flow. Allowing a company, or person, to take advantage of us for our skills and abilities in order to make some cash flow happen benefits no one. And, in the long run it can establish a pattern of business behaviour in us that may end up destroying us and our company. One of the neat things to come out of my trip to Toronto for the SMB Nation event there was an invitation from Harry Brelsford of SMB Nation to write a technical article for the SMB Nation Magazine: SMB Partner Community Magazine. The article is focused on Small Business Server 2008 and is now available at the above link! If you register on the SMB Nation site, if you have not done so already, you can receive a free mailed copy of the magazine anywhere in North America. There have been a number of articles written by various SMB or key technology folks over the last while indicating that the solo shop or fly by the seat of the pants consultant should see the writing on the wall. Susan Bradley: So your thoughts about the call back support? Karl again: The Last Leg for SBS? With the upcoming changes that Microsoft is implementing for business critical support for SBS products, the consultant calls in for that support creates an incident and will receive a call-back from Microsoft Product Support Services to work on the problem. When Microsoft announced the changes to the Business Critical Support (BCS) policy, there was a lot comments on the "fact" that charging for BCS was a bad idea. This begs the question: Why is it a bad idea? We operate an I.T. business that generates its revenues via providing implementation and support services for a variety of manufacturer's products. In most cases, we may have a FAQ, forum, or knowledgebase (Live search), or other such support mechanism provided by the manufacturer. The key here is that we provide products and services for a fee. We do not provide them for free. We may make small allowances for our clients that spend a good portion of their I.T. budget with us, but we ultimately charge for our services. While there are manufacturers that do provide some sort of free technical support for their partners, things can get out of hand. Just ask Vlad here: Things that piss Vlad off: SMB Enterprise White Paper, and here: Hacking OWN Support: DRaaS Encyclopedia, and here: Should free content creators be commercially compensated for giving away things for free? Check out his blog for more: Vladville.com (Live search for RTFM). Microsoft is no different than us as far as providing products and services for a fee. Yes, we are supporting Microsoft products ... but with the understanding from our client's perspective that we are trained on those products. This bears repeating: We are supposed to be Professionals. Essentially that means that we are thoroughly knowledgeable in the intricacies of the solutions we design, implement, and support. We have taken the time to pay for training, certification, technical books, technical mentorship, and business mentorship to build up our product and business knowledge as well as the product and business knowledge of those that work for us. Coming back to Microsoft and their support policy for those of us that support the SMB with a specific focus on SBS: It is in Microsoft's best interest to charge for that service. While the $8,000 a year support policy that enables one to get front line support might be a little high for those of us with a one or two person shop, we can certainly pay $4-5,000 a year for the service. That $4-5K a year is an insurance policy for those times where there is absolutely nowhere to turn when things go sideways. That fee would weed out most of the calls that have absolutely no right to be in the BCS queue. Having that fee would eliminate the need to outsource ... giving us the assurance that the person on the other end of the phone will indeed know their stuff. Ultimately, it would give Microsoft the opportunity to recognize those Partners that were willing to invest in their own and Microsoft's business presence ... and perhaps focus their partner building with them. If Microsoft does offer such a support policy oriented to the SMB/SBS Partners, we would be first in line to sign up. We just received a disk for our Open Value Licensing Office 2008 for Mac with service pack 1 integrated. A download on the MVLS site for the service pack 1 integrated version is not available yet. The Microsoft Office 2008 for Mac Service Pack 1 (12.1.0) download link. The download is approximately 180MB. We have not applied this update yet, though Office 2008 for Mac is installed on our iMac with Mac OS X Tiger. It looks as though the next step for us is to flatten the iMac and run through setting it up on SBS 2008. The new SBS 2008 WSUS management features actually allow us to exclude it from being monitored by WSUS and thus eliminates the "This computer has not registered with Update Services yet" errors we get here. Sometimes there is a need to insert some HTML code or scripting into an email for a signature or to send some externally resident content to someone. In Notepad paste the required code and save as an HTML file. Find the HTML file that contains the needed code. Click the down arrow beside the Insert button. Click on "Insert as Text". Note that Outlook 2007 no longer allows code snippets inserted into the signature. There are ways to get around this, but given the nature of many spam filters out there ... the risk of losing that email may be too high. Outlook 2003 provides a "Use HTML as Template" option that we can insert into a signature though. Keep in mind that the email may never reach its destination as a result. Tip source: SitePoint Forums: Inserting simple HTML into Outlook. How many of us are running our shops solo? I am sure that there are many out there who are. How many of us are running a solo shop with a couple of contract technicians that are on call for busy times? This is the category we fall in right now. And, how many of us are running a shop with at least one to three dedicated part or full time technicians? This is the direction we are going to step into very soon. Computer Store (CS), how can I help you? ME: I need to know your price and ETA on the QX9770 please? CS: I think it is around $1,200 and I don't think we have any right now. CS: Our systems are down right now, so I am not able to get that information. CS: Our technicians like to tinker with the server, so we end up without our systems. "Tinkering" with the in-house server or servers or a client's server should be anathema (#3 in the definition) for us. In other words: An absolute NO-NO. If we don't have a couple of systems setup for the techs to get their creative juices flowing, then we are in a vary precarious position indeed. We all know what happens when a technician gets curious, right? ;) We gotta try it out or it drives us bonkers. By having some decent hardware, not some client throwaways, that the technicians can use for direct OS installs, configuration testing, and "Project Blowup" we are facilitating our technician's abilities to augment their skill set without killing our in-house or client systems. By having some decent hardware, think at least Quad Core with 6-8GB RAM and RAID, to host virtual machines on that are not sitting there waiting for CPU cycles ... thus causing extreme boredom to set in ... we can have our techs setup some pretty complicated network infrastructure based on client setups. Or, we can base the setup on client's restored to VM or hardware ShadowProtect images (with permission) to facilitate the technician's ability to test that GP or patch or update change based on actual production servers and workstations. Given the size of the above mentioned computer store, having their systems down for the hour or two during business hours could probably pay for a very decent lab setup. And that is the mindset we need to have: Having $5-10K worth of hardware sitting on a dedicated lab bench is not an unnecessary expense. It is absolutely imperative to have that lab setup today. We have so many new products coming down the pipe all the time. We need to invest the money and the time in getting to know these new products. We also have client systems we can swing into the virtual environment to test patches on. It is not difficult to obtain permission to use their images on our lab systems as they realize that we are testing for their own good. We need only keep in mind the security of the data in their images which are encrypted, and the VMs or hardware those images will be installed on. Think Windows XP Service Pack 3: We were able to swing a client's XP Pro setup into a VM and test their Line of Business applications with the service pack. Things seemed to run as they should, so after a week of using the VM as a regular desktop, the service pack was released to that client. There you have it. $4,000 and we have two decent rigs to run 4-6 VMs on that will not cause the techs to loose interest due to VM performance issues. Remember, we can probably count on our techs having a system, or systems, at home worth the cost of a small car. Developing and keeping a technician's interest in being trained or learning to properly utilize the technology our clients use is critical for our I.T. businesses! We need to have that small car technology sitting in our labs! TechNet Plus ($349 for download only and $599 for DVD - we are on the DVD subscription) can provide an unlimited access to the software needed to run the lab setup. Having the lab setup in place, the software licensing, and any other elements needed to keep the lab properly equipped, such as a ShadowProtect I.T. Edition subscription, should be considered a part of the Cost of Doing Business today. If not, "The writing is on the wall folks". We have had a rather large influx of business this week due to a local supplier of ours inviting us into their SBS accounts! It seems that finding technicians that work with SBS, or be trained on it is a pretty difficult thing in our neck of the woods right now. So, time pressures may not allow for much in the way of posts for a bit. Neat News: Co-Authoring an SBS 2008 Book with Harry Brelsford! This blog was started as a small effort on my part to share a little of the knowledge gained over the years working with SBS and within the SBS community. I must admit, that I have not had any thoughts of receiving any compensation for writing it. Note the absence of any ads or plugs for products. So, the invitation from Harry Brelsford to attend SMB Nation Toronto (previous blog post) was a pleasant surprise. I really enjoyed myself at the conference (previous blog post). While at the conference, Harry invited me to write an article on Small Business Server 2008 for the upcoming SMB Partner Community Magazine. It was also a very humbling one because the rough edges of my SBS 2008 knowledge base were honed by the very constructive criticisms of Sean. What an great learning experience that was. A co-authorship with Harry to write a new edition of the existing SBS 2003 Best Practices volume (about half way down the page)! The invitation from Harry to work with him on the new book was received in late June and we are just now beginning to work on the project. This process will work for both new and existing MS SQL database setups on ACCPAC. Note that the methodology is pretty straight foward for a new setup: The process finishes after one has run the ACCPAC Setup Wizard to configure the company. Our primary focus in this post is a very long struggle to get an existing ACCPAC client migrated to a new SBS installation that upgraded a peer to peer setup. Make sure to follow the SBS password security guidlines for the client's setup when creating the user passwords for these accounts. Note that their passwords must be set to not expire. Depending on the client configuration, further restrictions on these users can be initiated via OU and Group Policy Objects. Click + MYCDAT (repeated for MYCSYS too) --> Security --> Users --> Right Click in the white space under the user list on the right and "New User"
Set the Default schema to "dbo"
We now have two blank databases to work with that are ready for the ACCPAC setup wizard. If a mistake is made, all we need to do to start over is delete any tables under MYCSYS and MYCDAT --> Tables (click on the first table - NOT THE SYSTEM TABLES FOLDER - then SHIFT + the last table entry, right click and Delete. For new installations, run the ACCPAC setup wizard and input all of the relevant dates, data, permissions, and users with their passwords. Note that there will be other setup steps that will need to be accomplished such as setting up security on the ACCPAC Database Setup console that are beyond the scope of this post. For existing installations, keep things relatively simple: set the date as 1/1/200x, currency type, and then Next repeatedly until the process runs through creating the database tables. Click on ACCPAC Database setup and both MYCSYS & MYCDAT will show up. Run the ACCPAC Database Load utility to recreate the company data from the last backup made before the last server was downed. Logon to ACCPAC on the server as the data's admin. All should be good to go from there to install the software on the workstations and connect to the server. Note that the ACCPAC Database Setup utility on any workstation will muck up the server settings if the MYCSYS and MYCDAT entries are modified/deleted! ODBC System DSN settings should be taken care of by the ACCPAC install. After we were finished the above setup steps, we had our client's ACCPAC installation fully functional on the SBS 2003 Premium server with MS SQL 2005 SP1 installed. If need be, for larger firms, we can initiate the SQL 2K5 install routine to install a dedicated SQL2K5 instance for ACCPAC's purposes prior to performing the above steps. 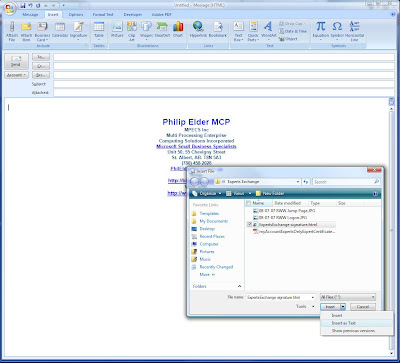 SBS - Dragged email to my Mailbox - Philip Elder folder ... where did it go?!? This was probably one of the more interesting predicaments that we needed to research today. A user accidentally drags their email onto the Mailbox - User Name root in Outlook that is Exchange integrated. There is no real way to get to that email using any Outlook folder hierarchy. Well, if we are running Windows Vista, we can click the start button and type a few of the email's details to bring it up in the search results. From there, it is a matter of right clicking on the email in the search results and clicking on "Move to Folder" to place it back into a regular email folder. If we are not running Windows Vista, and the Desktop Search feature does not find it on Windows XP, then we need to build an Advanced Find in Outlook. The neat thing about the Advanced Find is that we don't need to know any keywords. We need only click the Browse button and select the Mailbox - User Name folder along and not Search Subfolders. The search will happen quite quickly and we will be able to highlight them all and right click on them to move them to another folder. Note that they are found in a folder called the IPM_SUBTREE. Ultimately, what lead us to the solution was having all email in Outlook read, right clicking on one and marking it as Unread, then dragging it over the Mailbox - User Name and letting go. The Search Folder for Unread Mail showed one! Click on the Unread Mail Search Folder and voila: We have our missing email in the above IPM_SUBTREE folder. We realized after the fact that the Windows Vista method also reveals this folder ... if we have the Folder column enabled in the search results! With that information in hand we were able to find Gilg's Weblog post: Finding lost mail in your top level Outlook/Exchange root that pointed us to creating the Advanced Find in Outlook. We restructured the find with no keywords and having it point only to the Mailbox root to discover any items there. I happened to stumble onto this product in one of our local hardware stores. The sizes they had were more oriented towards nails and small nuts and bolts. So, a quick search turned up the product manufacturer's Web site: Viewtainer.com. We purchased enough Viewtainers via their Web site to cover each workbench station and our technician's tech cases for 4" and 6" zip ties. A few extra small ones were put in use as common chassis screw carriers. On top of the Viewtainers we find a closed slit that opens when one squeezes that end. They make zip tie access quick and easy without the subsequent mess. The Viewtainers have eliminated virtually all zip tie and chassis screw spills and work bench messes during system builds, system rebuilds, and system maintenance. We have a company policy that on all of the systems that pass by our workbench, we make sure that all cables are appropriately zip tied to eliminate clutter within the chassis and improve air flow. Over time, with enough systems passing over the workbench at peak busy times, prior to having the Viewtainers, things could get quite messy. These little gems have helped to make cleanup in between jobs that much easier for our technicians. Adobe has released a new version of Adobe Acrobat Professional and Acrobat Reader. Adobe is pleased to announce the release of Adobe Reader 9 for our Tier 1 languages of English, French, German and Japanese. Other major languages will follow next month. Improved launch speeds: Experience enhanced general performance and reduced launch times. PDF Portfolios: Easily navigate through diverse collections such as drawings, e-mails, spreadsheets, and videos—all in a single file. Adobe Flash® software support: View rich media content such as Shockwave®, Flash, and streaming video files. Once a major new version such as this comes out, you have 6 months to update from your older Reader 8. The above public links bypass the need to install the Adobe Download Manager for a Web browser and an optional toolbar. This is one set of downloads that we will add to our Technician's Thumb Drive and also to our application install points on our managed networks. Intel maintains a site that is dedicated to informing the channel on any promotions on their products. The site: Intel Channel Promotions. This particular link gives those in the U.S. or Canada a quick overview of any product promotions by product category such as server, mobile, storage, etc. For those outside the U.S. or Canada, there should be a site dedicated to your geographical area. If you happen to know the site URL for your region, please feel free to post it in the comments and thanks for that in advance. BTW, a reseller account is not needed to have a look at the current promotions. Promo pricing is available through authorized Intel distribution centres. Promotions are added and removed weekly, so have a look on a regular basis. The information there could help improve the profit margins when it comes to configuring server and desktop products. A quick search turned up the following on the TechArena forums: Failed DCdiag Test. That in turn lead us to: MS KB829623: Default Services That Are Installed in Windows Small Business Server 2003. Note that the ISMServ shows up in the "Disabled" services list. Thus, there was no cause for concern.